Is your product included in this recall? 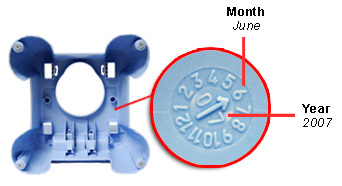 This voluntary recall involves only the specific The First Years 3-in-1 Flush & Sounds Potty Training Seats below, which were sold at mass and specialty retailers nationwide from April 2006 through August 2007. 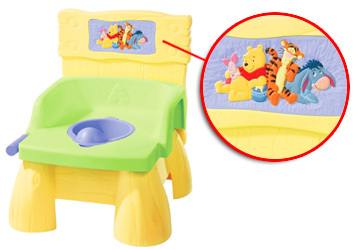 RC2 has determined that there is a potential unsafe level of lead in the surface paint of the Tigger character on the molded, recessed area of the back seat of the product. Please have your potty training seat nearby as you review the information below. If you determine that you have one or more of the items listed below, please follow the remedy instructions farther down on the page. How do I know that what I have is recalled? This potty training seat features a yellow base and back, green seat area and a purple lift-out pot. 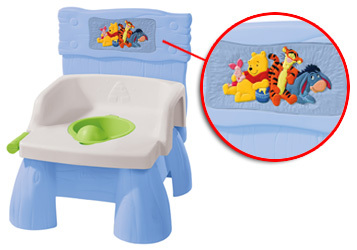 Disney characters Piglet, Winnie the Pooh, Tigger and Eeyore are pictured on the molded, recessed area of the back seat. If you determine that you have one or more of the affected potty training seats, please order your Transparent Protective Cover. This potty training seat features a blue base and back, white seat area and a green lift-out pot. Disney characters Piglet, Winnie the Pooh, Tigger and Eeyore are pictured on the molded, recessed area of the back seat. There is no need to return the recalled potty training seat. Medical experts say the primary concern with lead arises when a child chews and swallows paint containing excess levels of lead from a toy or other source. Working closely with the CPSC, RC2 determined that the potential safety issue can be readily corrected in the home with a clear protective cover available free-of-charge from the company. The easily-applied protective cover is a permanent solution that eliminates a child's access to the plaque. Until the protective cover arrives, consumers should keep these items away from young children when not in use. I live outside the United States and Canada, please click here to look up the contact information for your local distributor. My product is not affected by this recall. Please take me back to the home page.